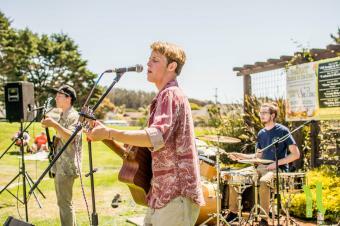 Panga’s music boasts energetic melodies full of playfully-serious undertones, abstract views and a California way of life unique to the Central Coast. Their sound reflects an experimentalist’s fusion of Acoustic Rock, Grunge & counter-culture Pop from the 90′s, as well as tastes of Reggae, Folk, Jazz, and Latin rhythms. The group enjoys audiences of all sizes and engages them with not only their expressive wit and humor, but also reflections on love, life, and the many metaphysical aspects of the Universe as the inspirations for their songs. Their vision is to inspire people to hop in their own hand-made panga boat, kick back & fully enjoy that feeling of nothing to do yesterday, today or tomorrow. Catch the charismatic intelligence of this duo’s music that’s sprawling the nation! Buy your physical copy of their Debut LP from the website or download it on iTunes, Amazon, Spotify, etc. !